﻿﻿Balmorhea offers more than a summer splash in the state’s coolest pool. ﻿Balmorhea State Park is perhaps best known as a summertime destination when the park is filled with swimmers and other sun worshippers. But autumn and winter can be magical times to experience the park as well, with smaller crowds and a few hidden surprises. What many people call the “swimming pool” at Balmorhea State Park is actually an impoundment of natural spring water built by the Civilian Conservation Corps between 1934 and 1936. The outflow of San Solomon Springs maintains a constant temperature of 72 to 76 degrees year-round — the average temperature of the underground rock layers through which the water flows. Though always refreshing, the water feels much warmer to the touch when the surrounding air temperature is lower. Thus, swimming during the cooler months can be surprisingly pleasant and “warm.” Just have plenty of towels ready to wrap up in when you emerge! 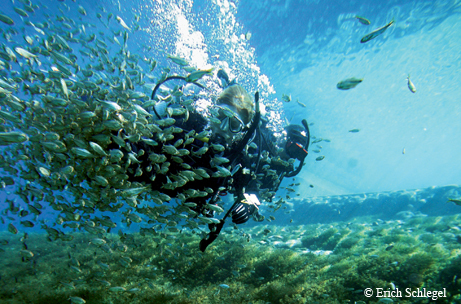 Scuba divers and swimmers are drawn to the clear waters of Balmorhea. Occasionally during autumn and winter, the pool is enshrouded in fog that resembles wisps of smoke arising from the surface. This “steam fog” forms when cooler air moves over warmer water. As cold, dry air mixes with warm, moist air hanging just above the water, the warmer layer chills down until it reaches a humidity level of 100 percent, resulting in fog. Park Superintendent Jacob Barton shares his delight in this natural phenomenon. The park is a great birding destination at any time of year, but autumn and winter can be particularly interesting. Waterfowl abounds in the Balmorhea area in the colder months. Loons, grebes, cormorants and ducks take advantage of the park’s water resources, and a few individuals are often observed swimming and feeding in the pool. Great blue herons are common along the park’s irrigation canals and in the park’s re-created cienegas (desert wetlands), and if you’re lucky, you might also spot a bittern or night-heron. Keep your eyes skyward for a glimpse of a ferruginous hawk or even an overwintering bald eagle. Test your identification skills on a wide variety of sparrows that inhabit brushy areas in search of seeds. Balmorhea State Park is located four miles southwest of Balmorhea on Texas Highway 17, in Toyahvale. Facilities include a campground, picnic sites, an outdoor sports area and a playground. Pool hours are 8 a.m. to 8 p.m., seven days a week. For more information, call (432) 375-2370 or go to www.tpwd.state.tx.us/balmorhea.